The grizzled chef surveyed the landscape of TV's food shows, and - as usual - pulled no punches. We cull the 10 best quotes. Anthony Bourdain has limited patience for most food TV these days. Ah, to be Anthony Bourdain: He can say that your TV show is "a war crime on television" (coughSandraLeecough) but he's so goshdarned likeable, with his cigarettes and his earring and his badassery, that you just can't hold it against him. Thus emboldening him to be even less shy in his opinions about the current crop of food shows on TV -- as he was with MSN TV -- thus making him somehow even more likeable! 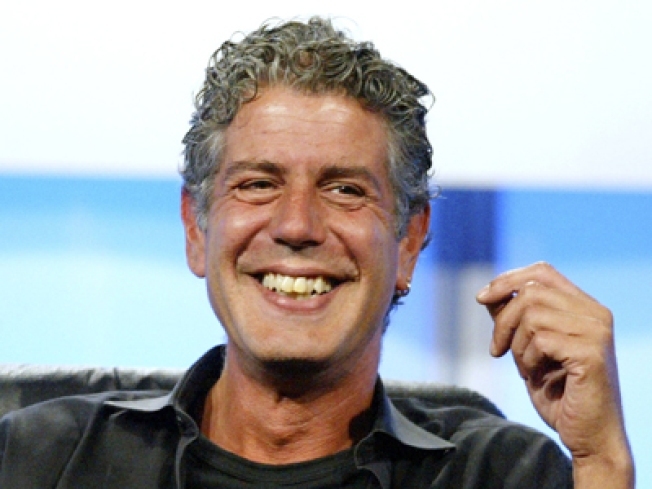 It's the neverending circle of Bourdain, and we heart him dearly for it. It was hard to pick just 10 nuggets from his tirade, and we encourage you to read the whole thing (nicely excerpted from MSN by EatMeDaily). 1. On Semi-Homemade Cooking With Sandra Lee: She makes her audience feel good about themselves. […] All you have to do is waddle into the kitchen, open a can of crap and spread it on some other crap that you bought at the supermarket. And then you've done something really special. 2. On Rachael Ray: My wife watches her, I hate to admit it. […] I think people respond to her because of her personality and not her cooking, which is pretty damned awful. She's very nice, and I base this on no inside information: She's big now, like Oprah big; the sooner she stops cooking, the happier we'll both be. 3. On Hell's Kitchen: There's no cooking. It's just a bunch of dimwits -- the lame, the halt and the delusional -- and [Gordon Ramsay] pretending to be angry. There's no suspense. None of these idiots would be qualified to work a Fryolator at a Chuck E. Cheese much less ever work in any Gordon Ramsay restaurant. 4. On Kitchen Nightmares: I love [Gordon Ramsay]'s restaurants. I like him. I wish him well. If having to be a caricature of his former self is going to get him bazillions of dollars, then why not? 5. On Paula Deen: I like her Southern-based shows, but I don't know if I want to see her in a muumuu cooking a Hawaiian luau. That makes the blood run cold. 6. On Spain ... On the Road Again: There's nothing worse than seeing a genius like Mario -- he's the smartest, funniest guy I know -- waste his talent. 7. On Mark Bittman: I don't think he adds value to anyone's TV show. He doesn't come off well on TV. Let's put it that way. I saw him make paella once on a TV show; he's been dead to me ever since. 8. On Iron Chef America: I have a soft spot in my heart for this show. But the judges, man. Have they had Richard Grieco on yet as a judge? I think they had Criss Angel on, for chrissakes. Who are these douchebags they put on there? […] to have [the chefs] judged by the likes of Mo Rocca makes me want to vomit in my mouth. 9. On Top Chef: Toby Young, what's up with that? He's an egregious add-on. They were looking for a snarky British guy, and Toby wrote a successful book that made a good case for his uselessness. He's lived up to that promise. 10. On Emeril Lagasse: … I've told him to his face many times, "I love you and respect you. I just hate your shows."